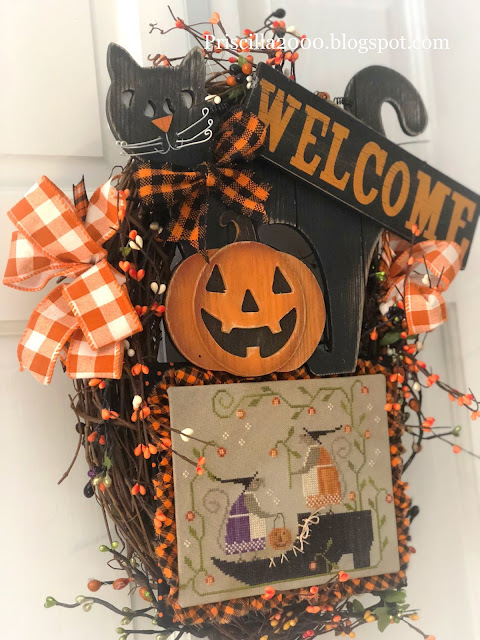 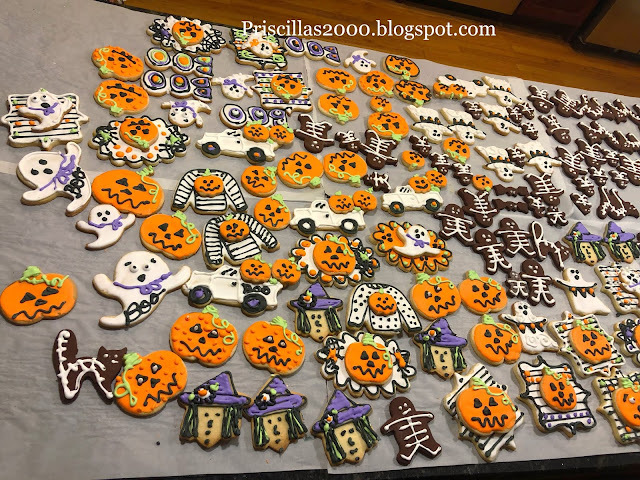 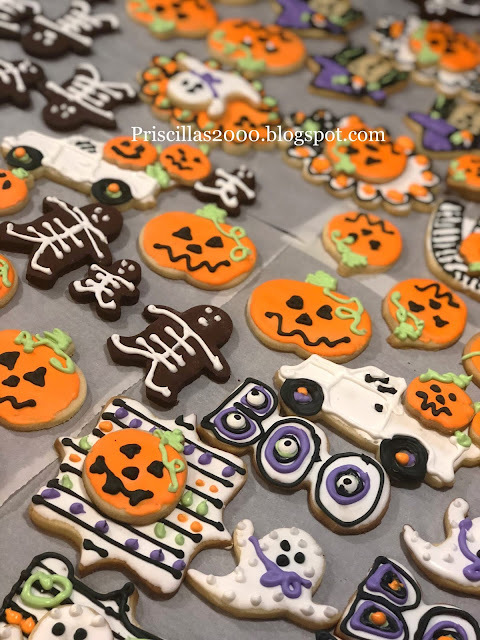 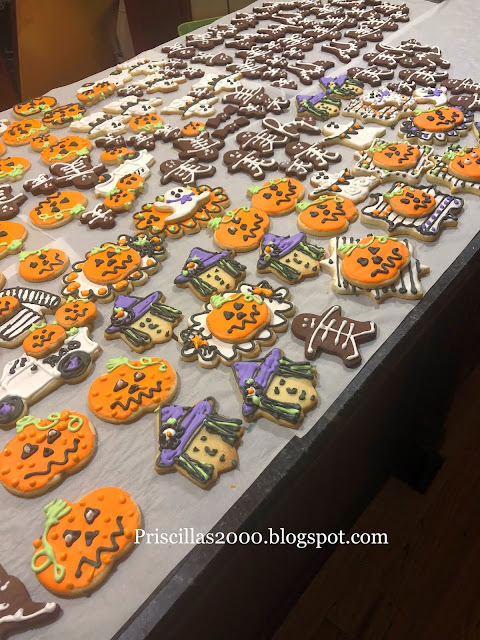 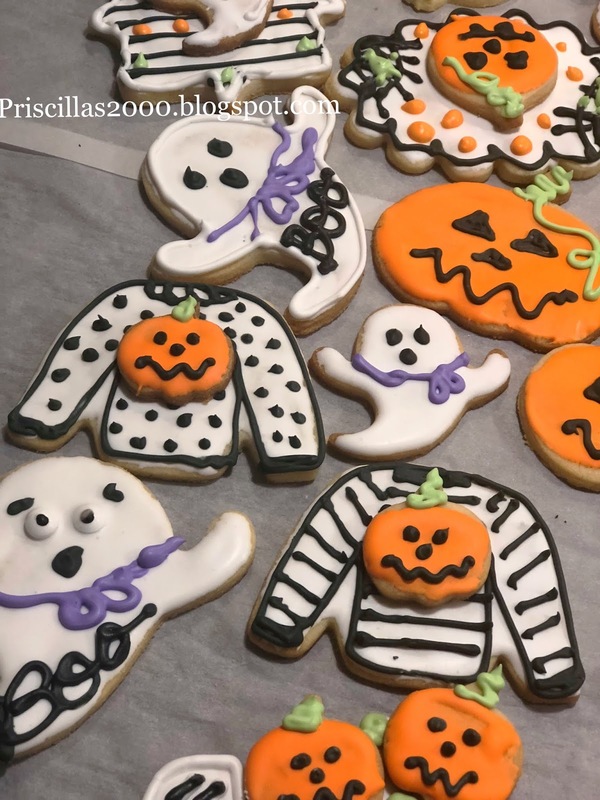 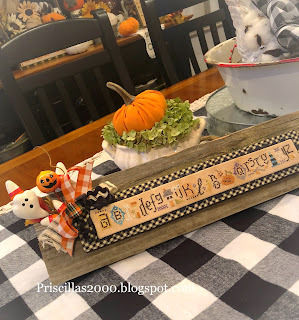 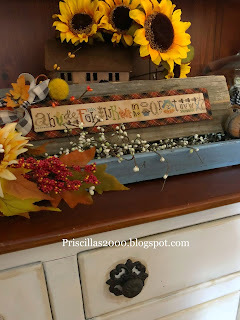 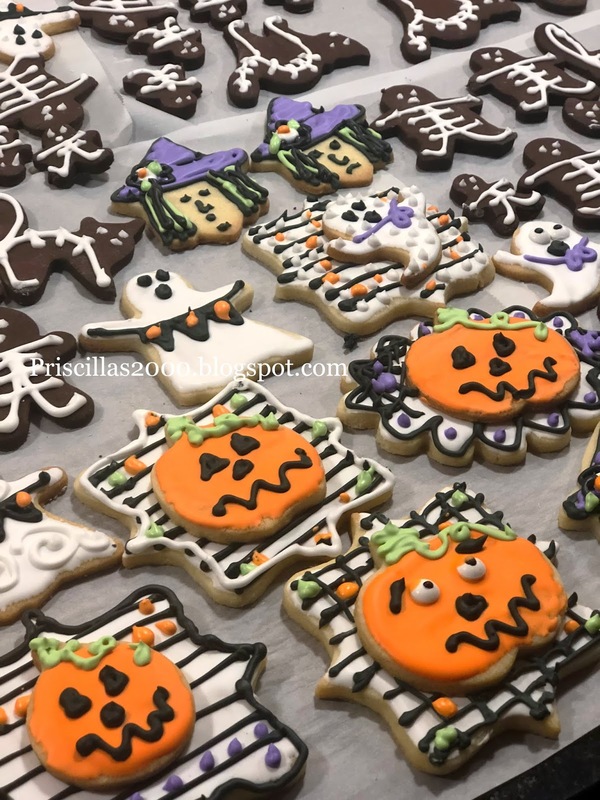 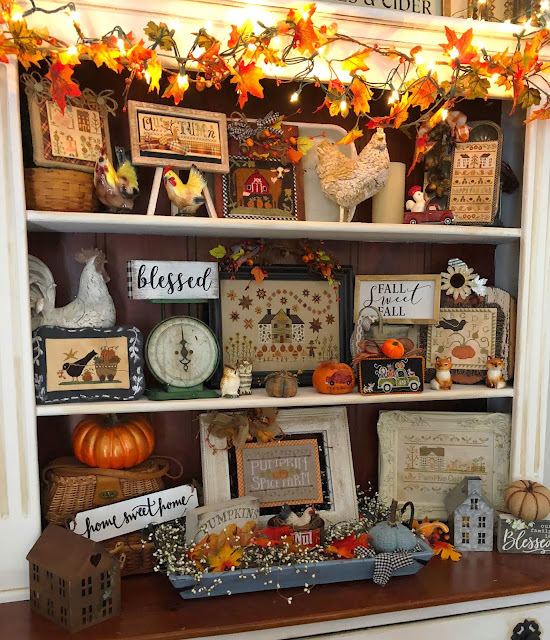 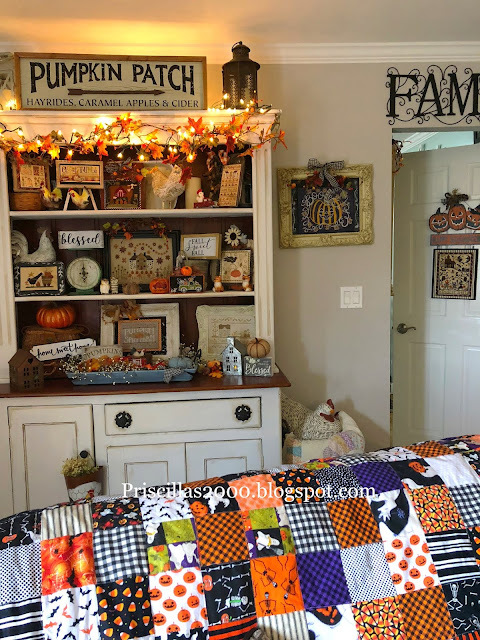 We started them October 6 th and used mostly fabrics that I had in my craft room .. We did add some from the The Loopy ewe who had given us a cute bundle of Hallowen prints.. 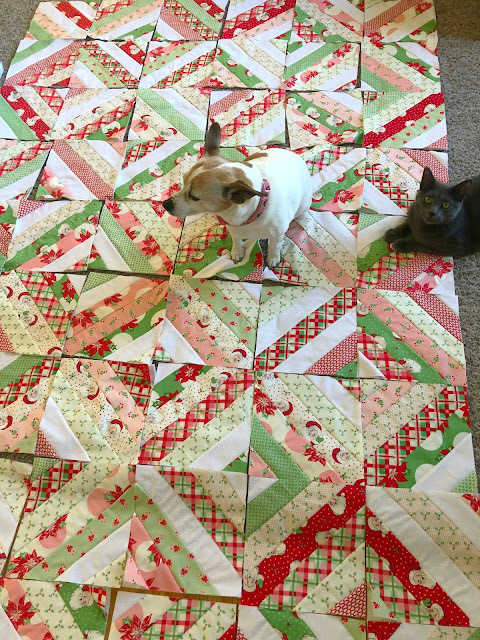 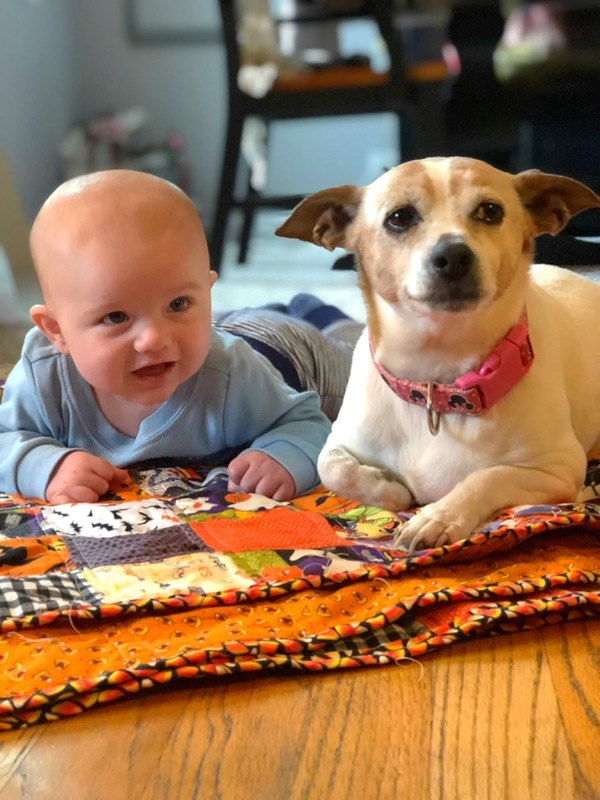 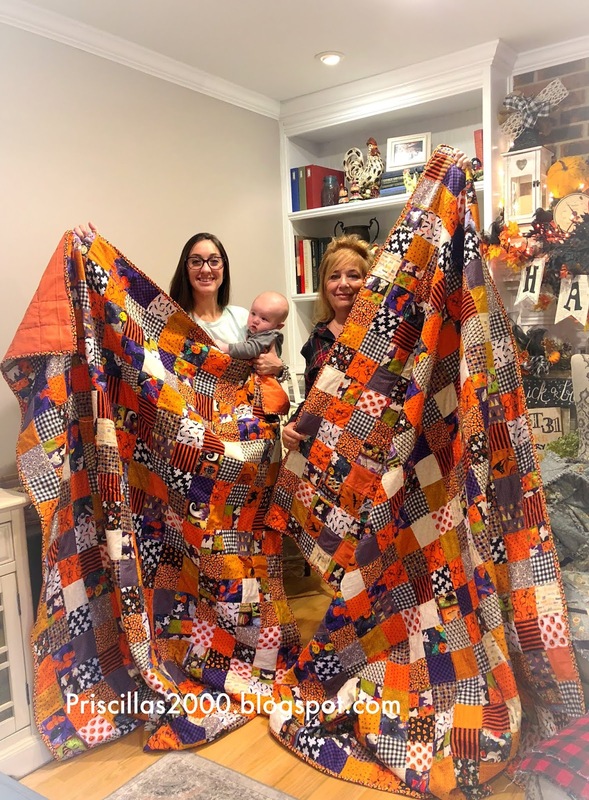 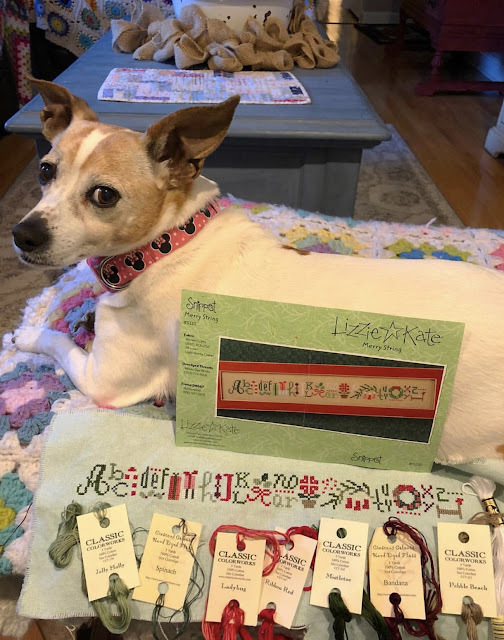 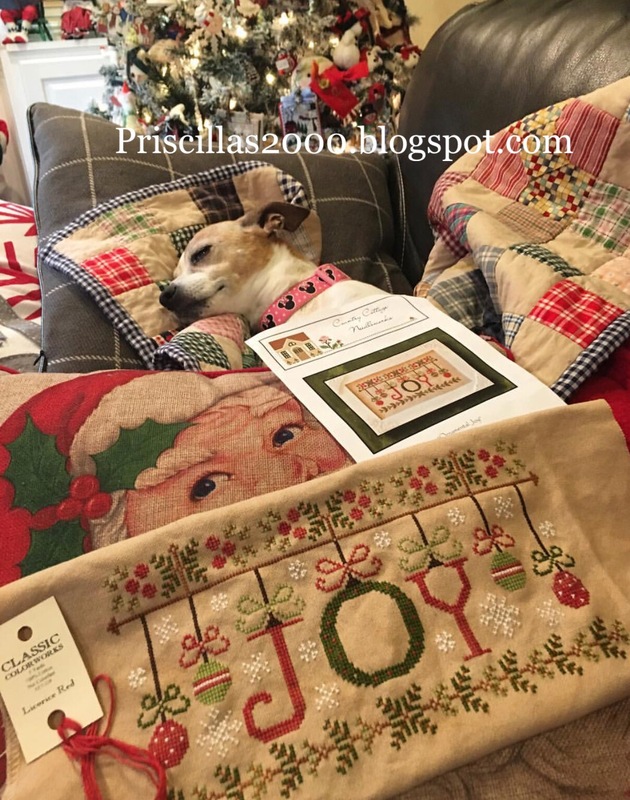 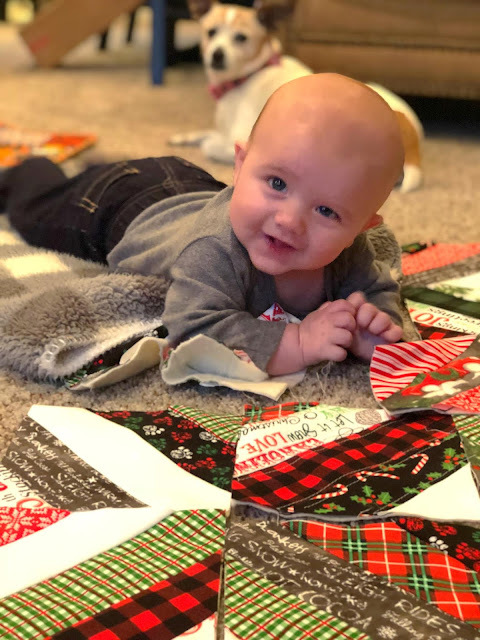 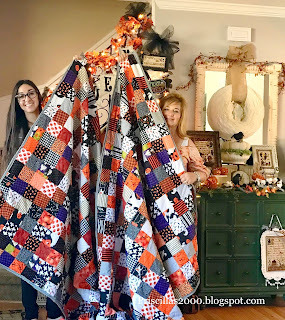 This is the video we watched to make these string quilts..
Chelsea started a baby quilt for Cash with a jelly roll and the quilt as you go string quilt .. her blocks are also 6-1/2 inches .. 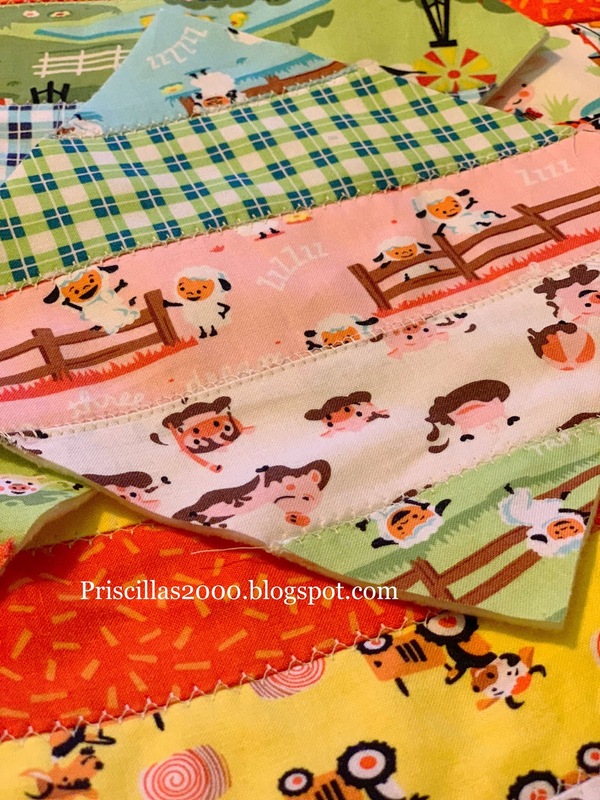 It is little farm fabrics and super cute! 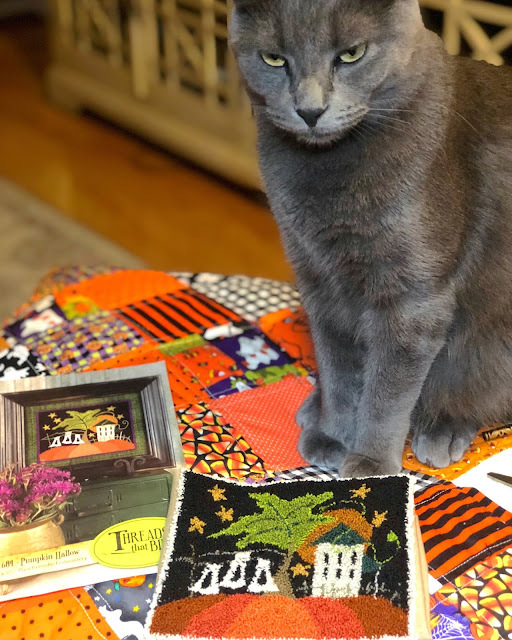 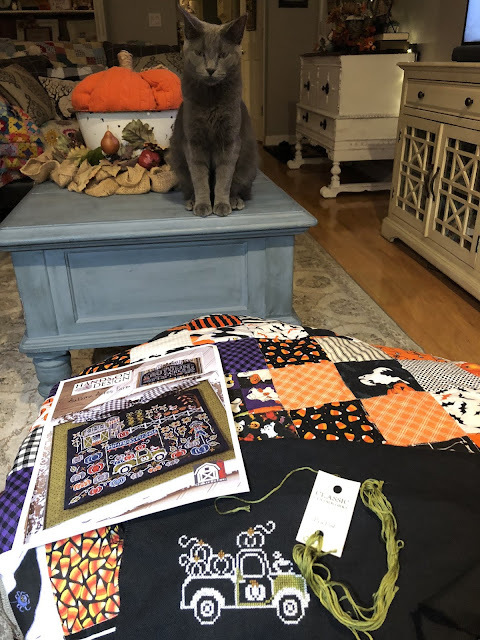 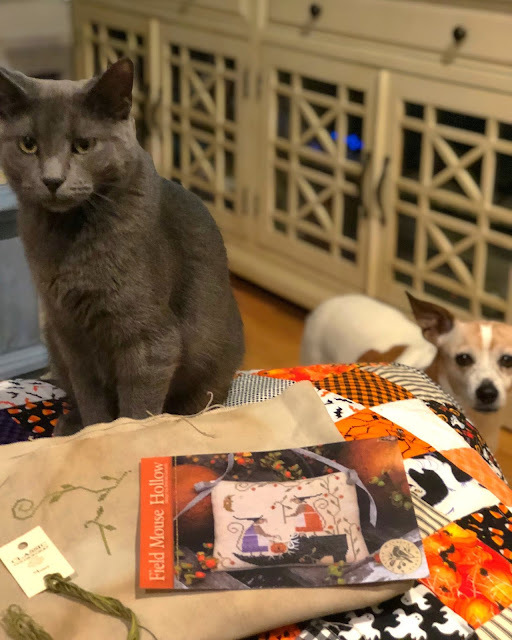 For the Halloween quilts I used candy corn for backing and another candy corn fabric for binding ..You can see even the Halloween cat approves :) As you can see we want our quilts to be used and they are already getting great workouts! Come on over! 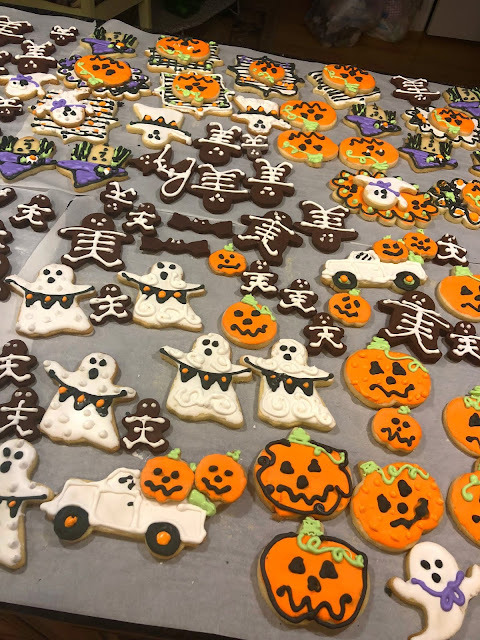 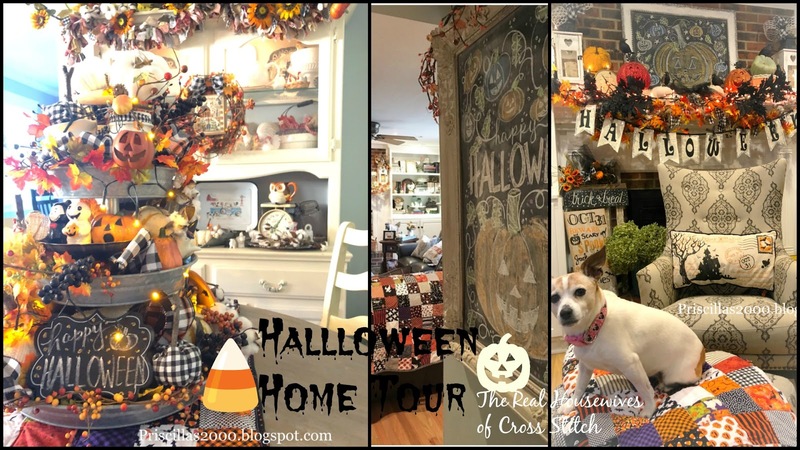 It's the Halloween Home Tour! 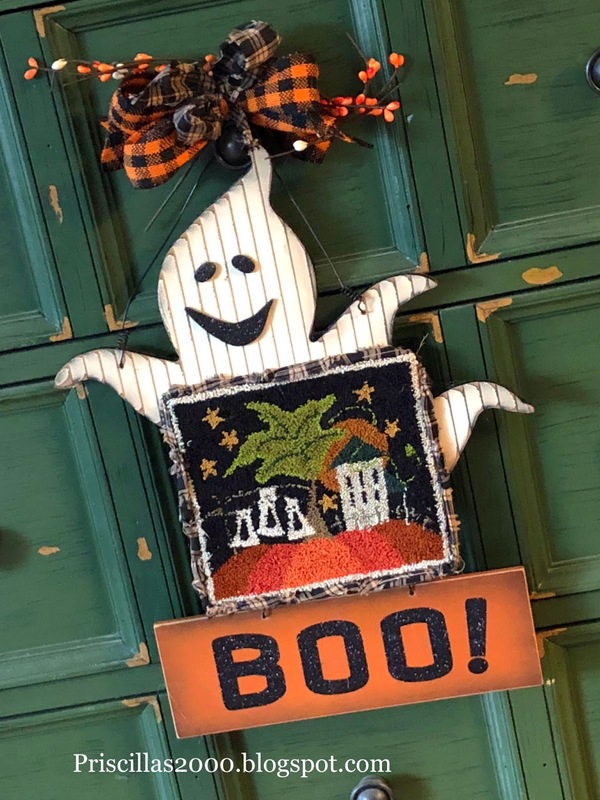 Click the photo above! 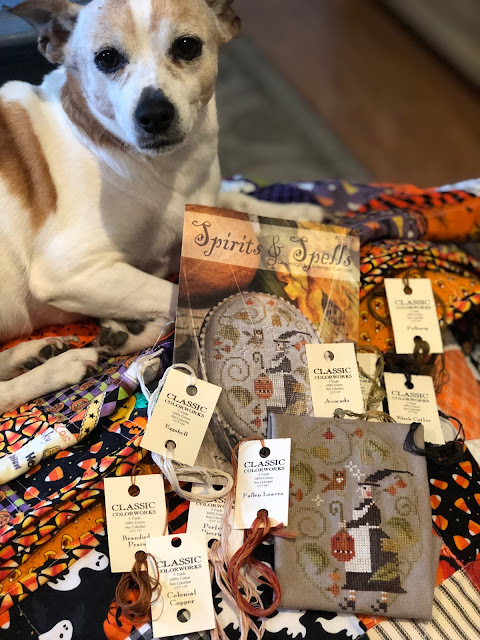 Calvin was so mad I was stitching mice I had to do something so he doesn't kill me in my sleep :) Just kidding ..
any way I finished stitching these cute mice yesterday and I had one last Halloween piece I had bought at Walmart and I think it is perfect! 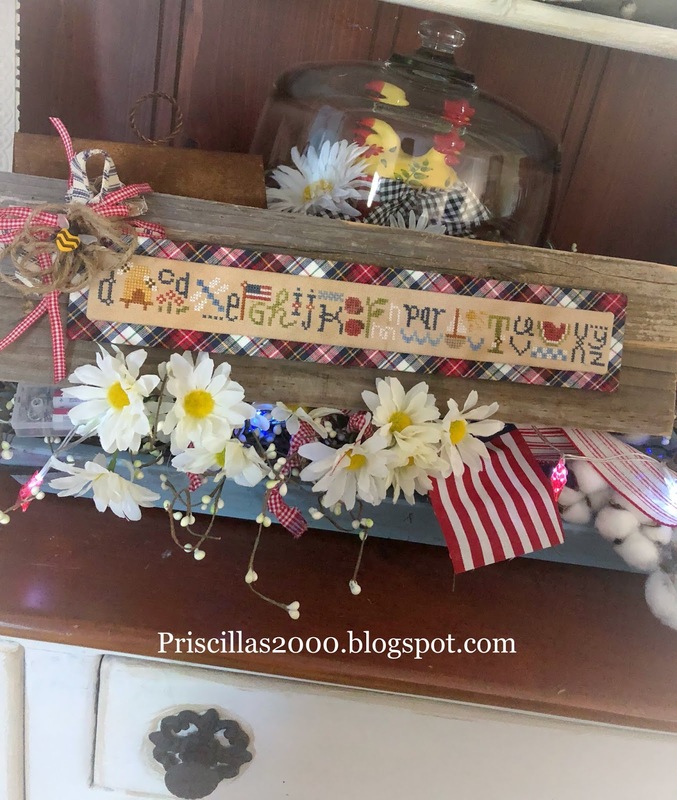 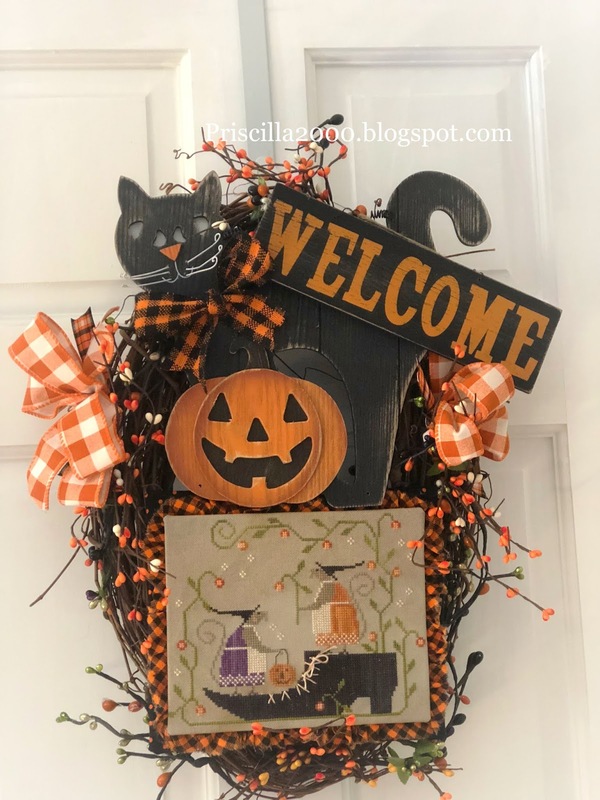 Right now I have it hanging on the powder room door but I think I will put it on the back of my front door .. 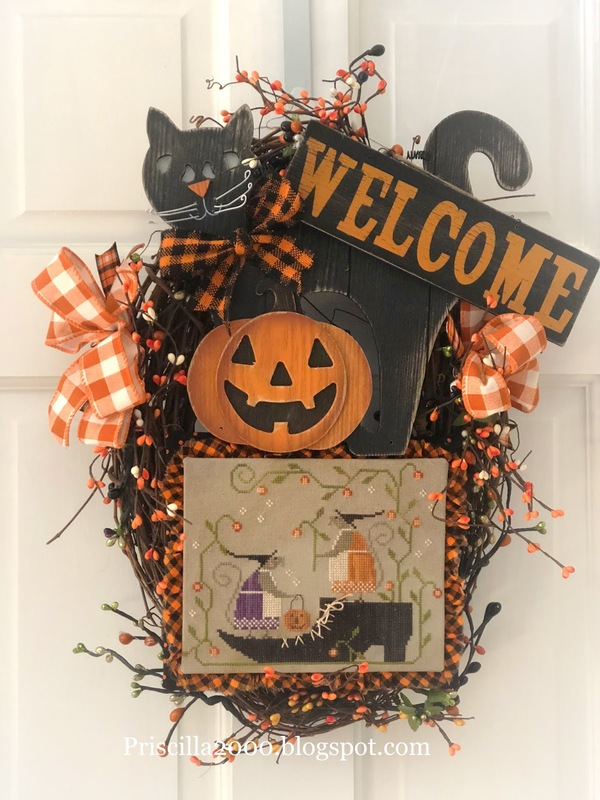 I wrapped Halloween colored berries around the wreath .. I cut the welcome sign off the wreath ..it was held on with wire and attached the cat with hot glue to the wreath.. I mounted the stitching on sticky board ..I mounted black and orange polka dot fabric on sticky board ..before I glued them together I added a torn ruffle of orange and black gingham ..I glued the back of the polka dot covered sticky board to the wreath and added 2 bows and more berries to the sides. I also made a bow for the cat and took off the burlap one it came with .. 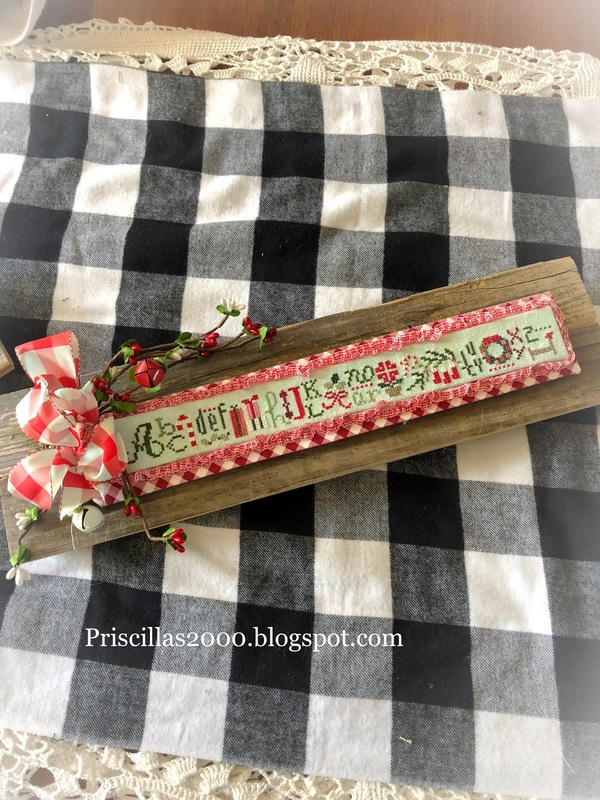 The classic Colorworks color floss I used .. 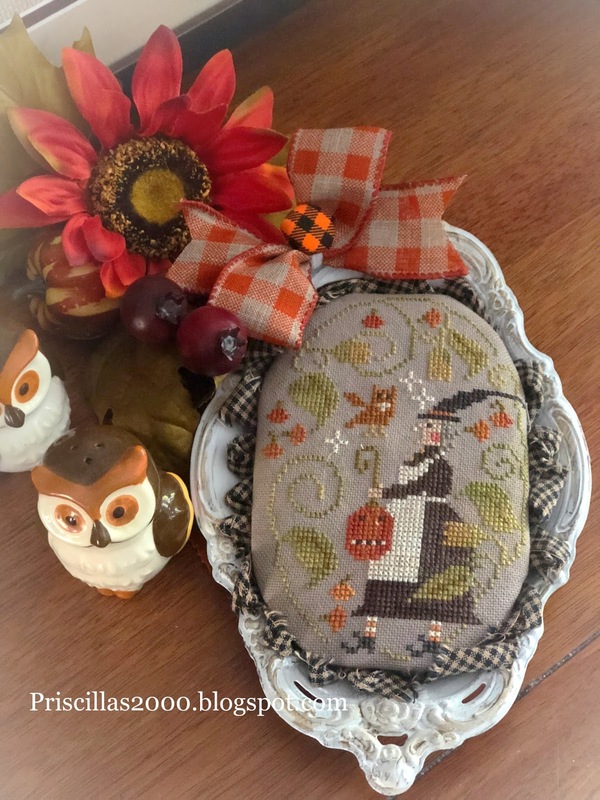 I used 28 count light grey tea/coffee dyed monaco ..I left out the stars and moon and added some more of the little eggshell colored designs and another sprig of bittersweet ..
My second punch needle is finished! 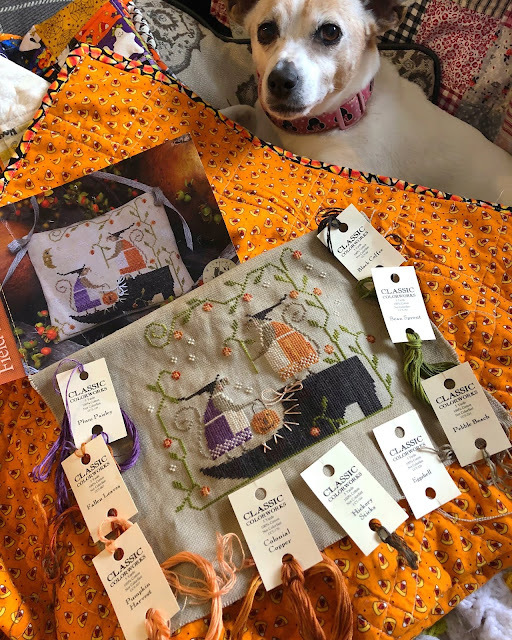 This is Pumpkin Halow from Threads that Bind ..and was given to us by one of our viewers.. 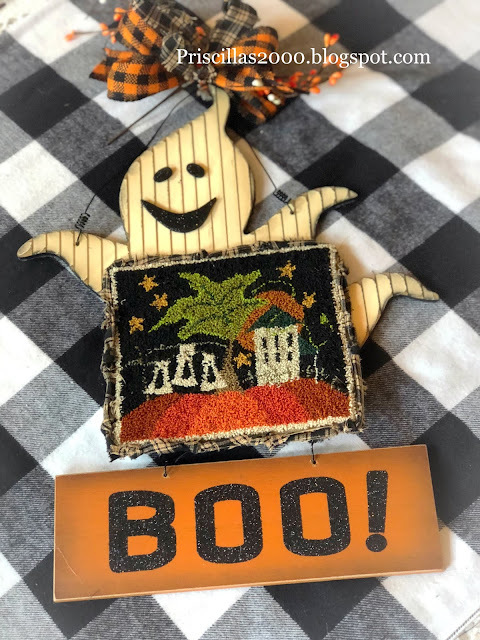 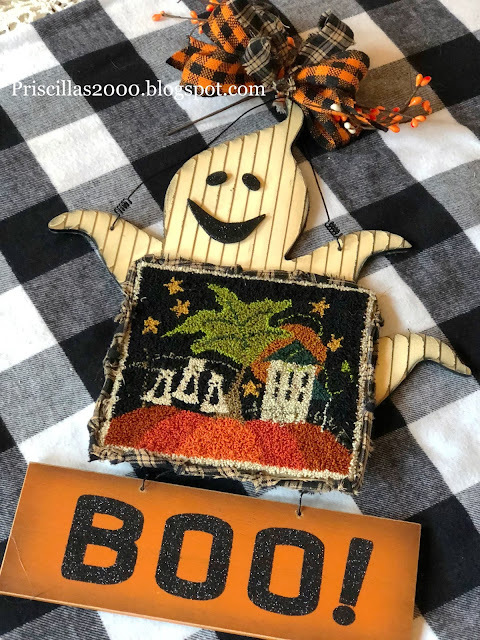 I found this cute ghost at Walmart .. mounted my punch needle piece on sticky board and then knotted some torn homespun plaid and attached it to the outside .. I glued it onto the ghost and ta da its finished and cute! 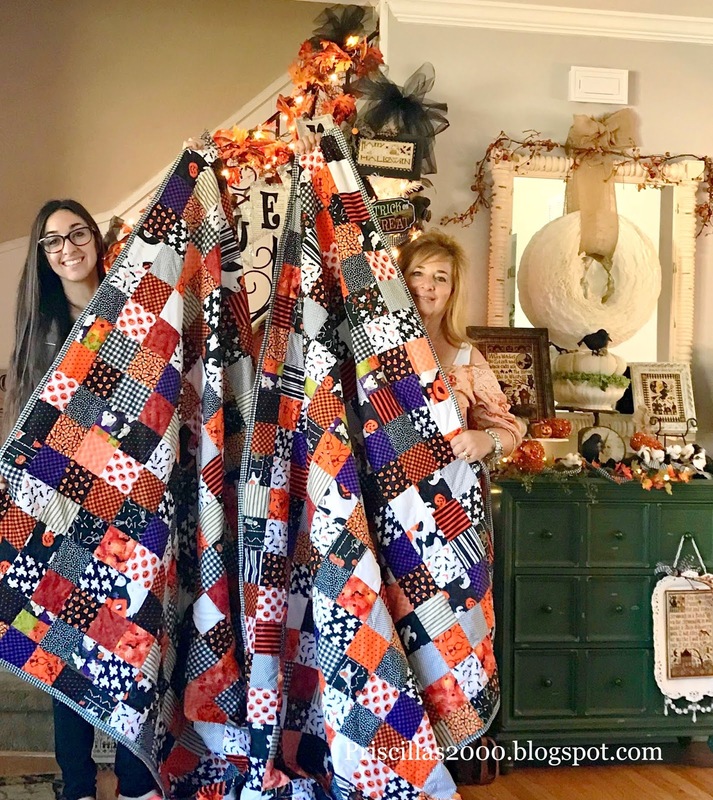 I added a bow of orange and black ribbon ..torn homespun and orange berries to the top..
You aren't seeing double :) I stitched one and my daughter Chelsea stitched one .. both are finished on the wood planks we have used for the other strings we have stitched .. 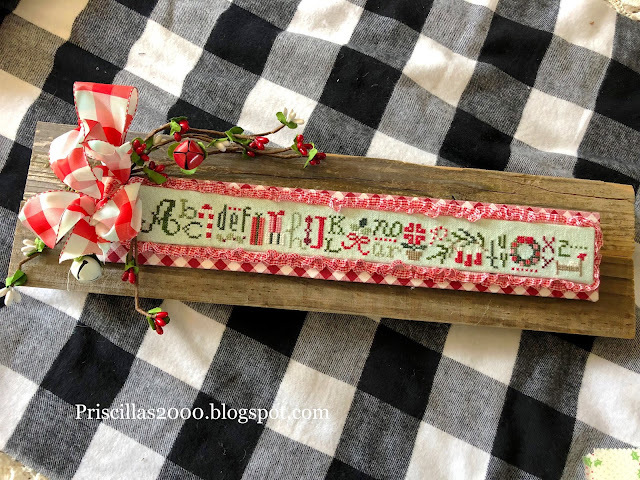 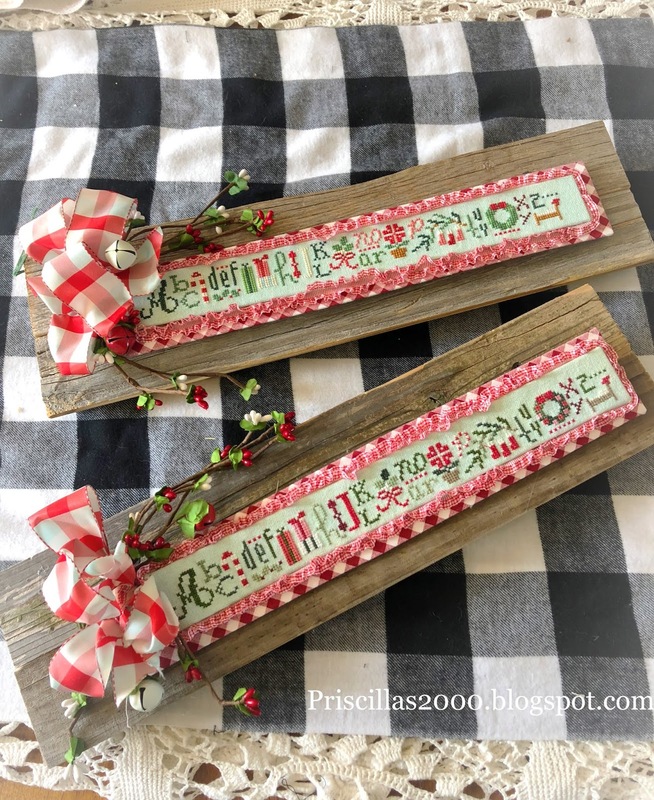 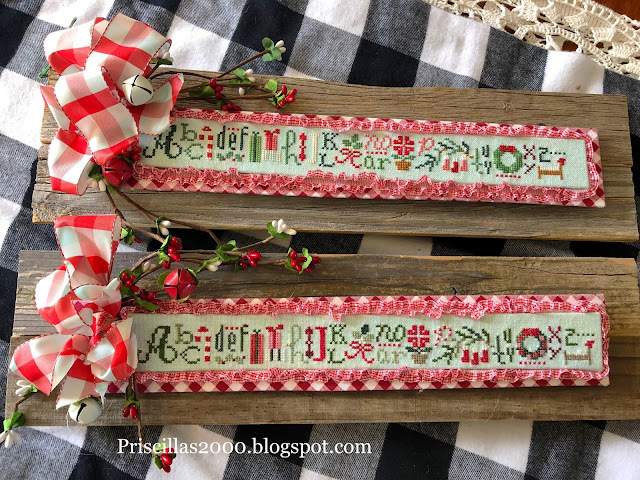 I used all Classic Colorworks floss and we both stitched it on 28 count evenweave that we dyed aqua ..
A bow of red/aqua plaid and some berries with bells of red and white completed our projects ..Of course I used magnets and washers to be able to interchange them .. 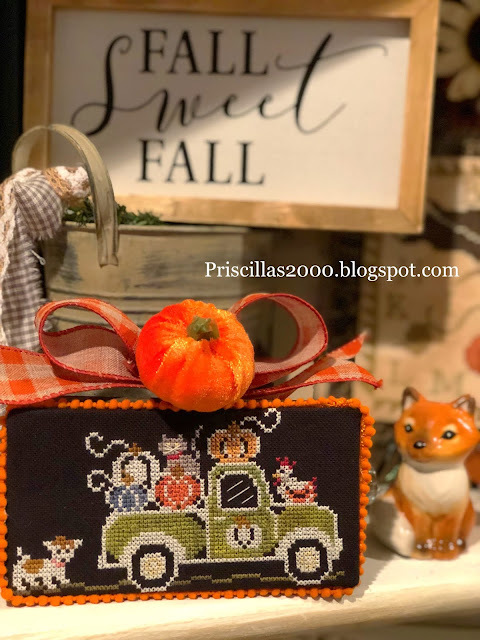 I finished stitching this piece Oranmental Joy from Country Cottage Needleworks right after Christmas last year .. I finally decided to finish it up this week onto an enamel pot lid that I found at a flea market .. 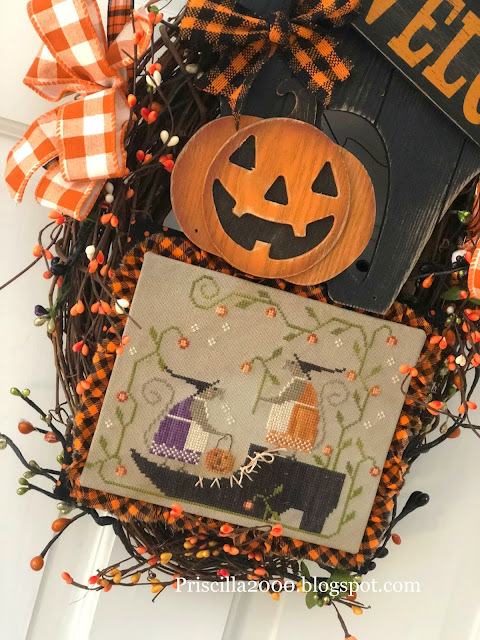 I mounted it on sticky board and added a torn ruffle of homespun plaid fabric .. 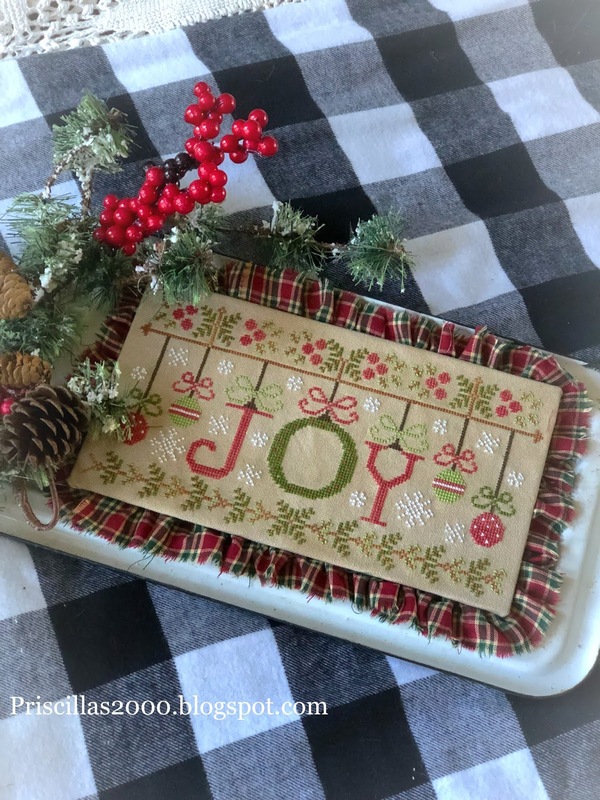 I used a magnet to attach to the pot lid and a magnet on the Christmas greenery pick .. I still might add a bow .. still thinking about that one ! I love it and can't wait to display it with all my other Christmas pretties! 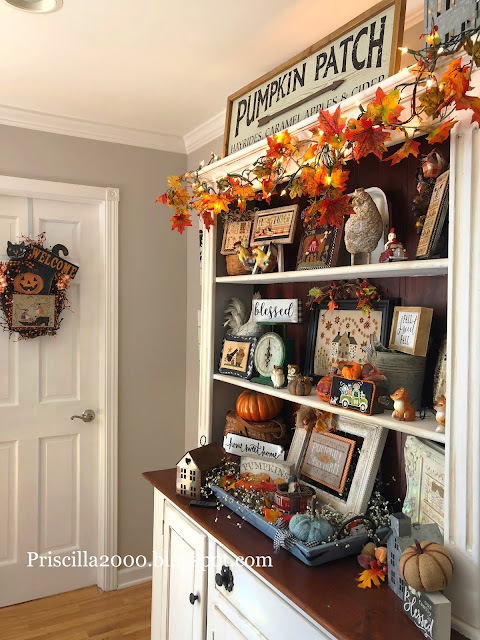 When I put all the Halloween decor out .. I kept some areas for just Fall and the hutch in the family room is one of those places.. 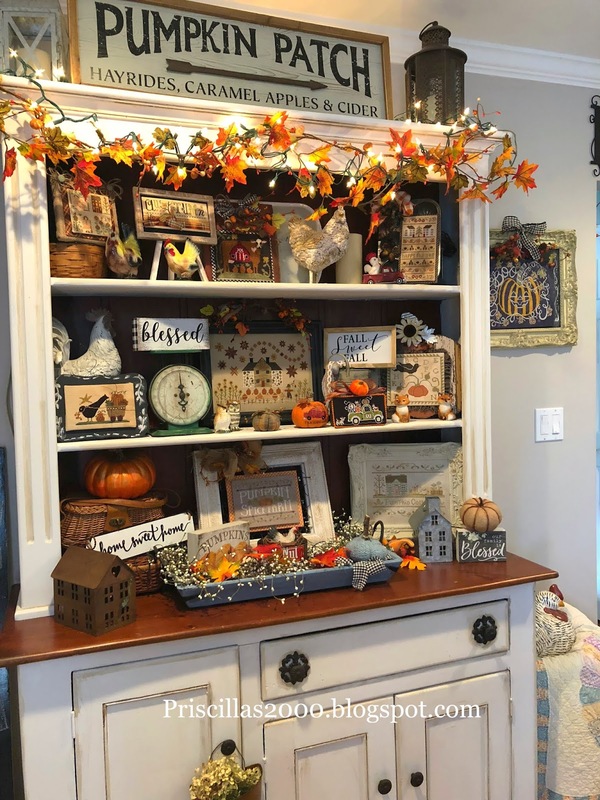 I found this hutch on Craigslist last year and chalk painted it linen white.. it was hunter green .. 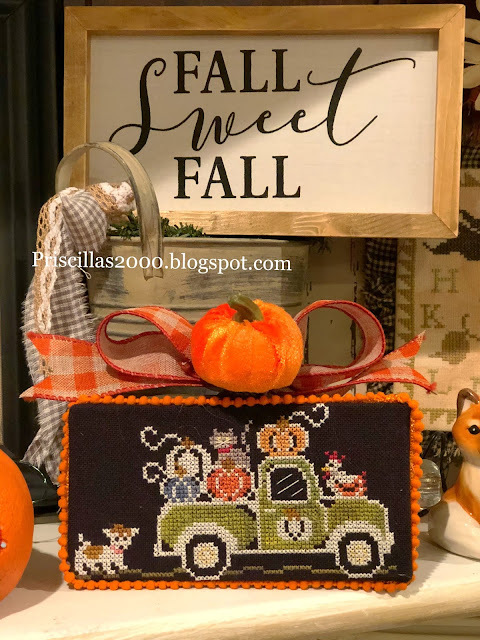 I took out the sunflower stitches and added a few other Fall pieces in .. 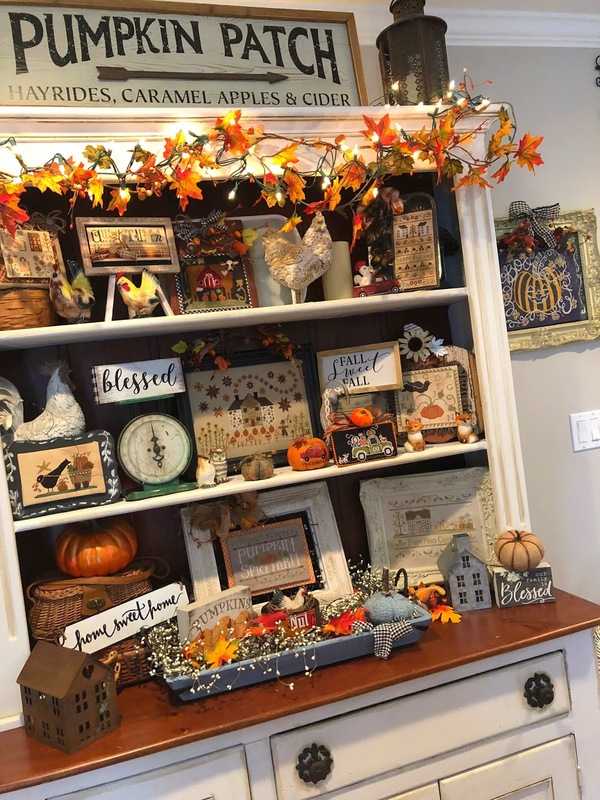 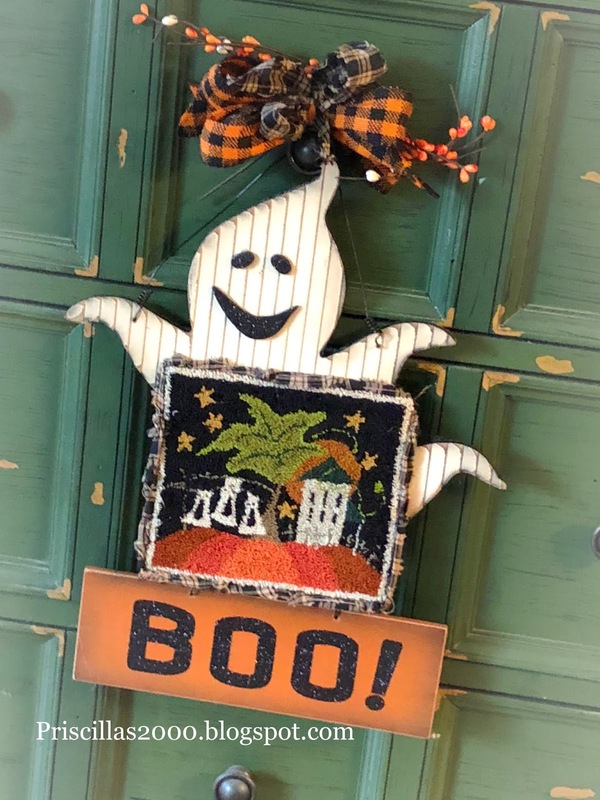 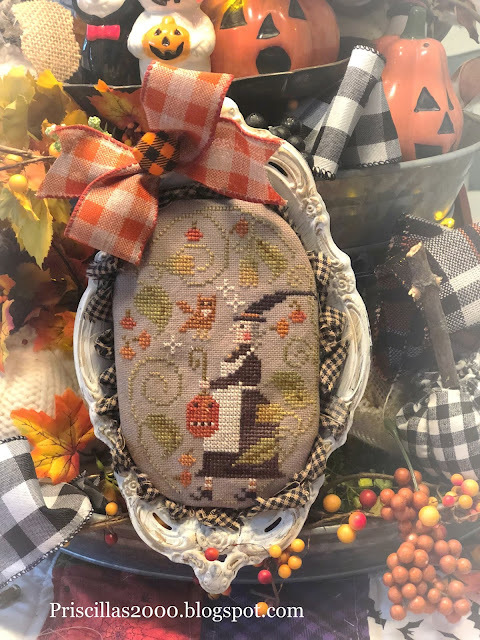 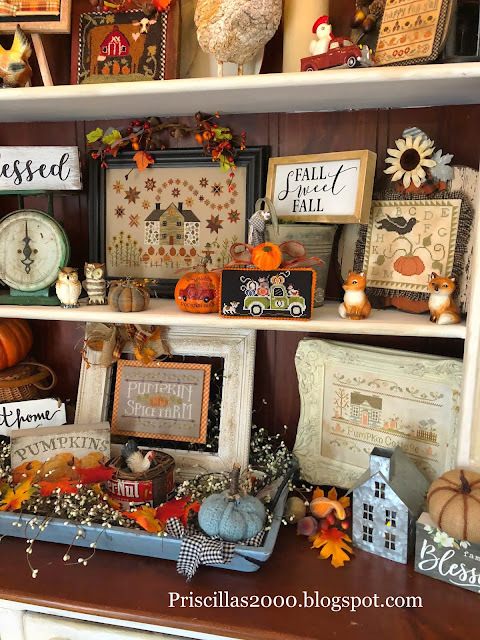 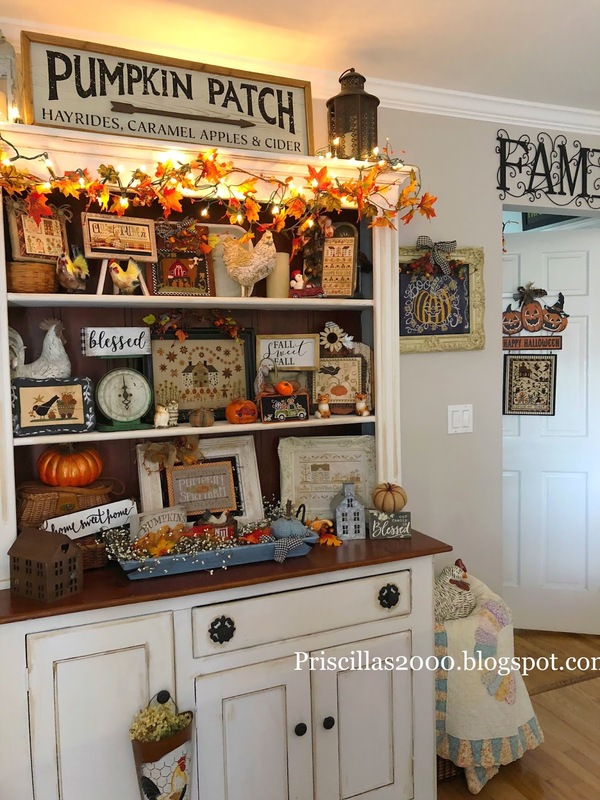 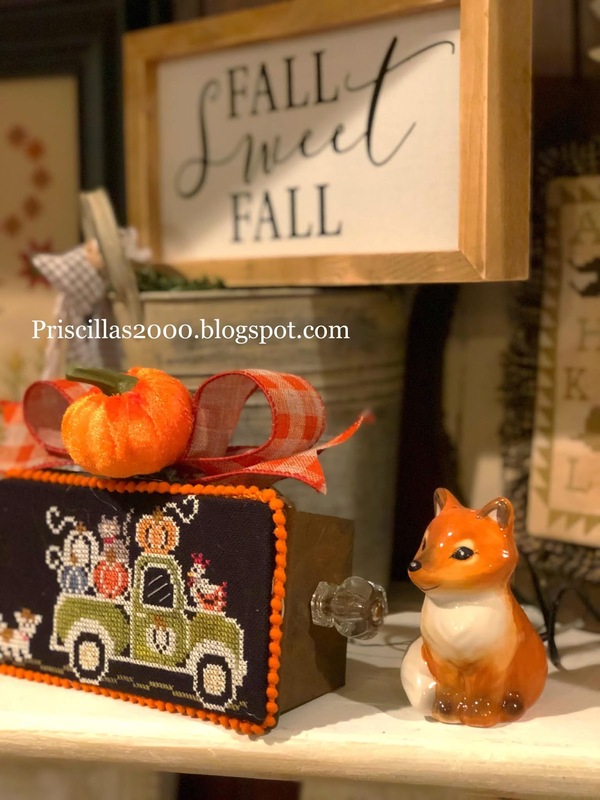 The Halloween from Seasons in Chalk art from Just Cross Stitch magazine ( my chalkboard to cross stitch collaboration with Hands on Design ) hangs on the wall next to the hutch ..
Is this not just the cutest ? This is Chalk On The Farm ..Autumn Acres ..My chalkboard to cross stitch collaboration with Hands On Design and me .. 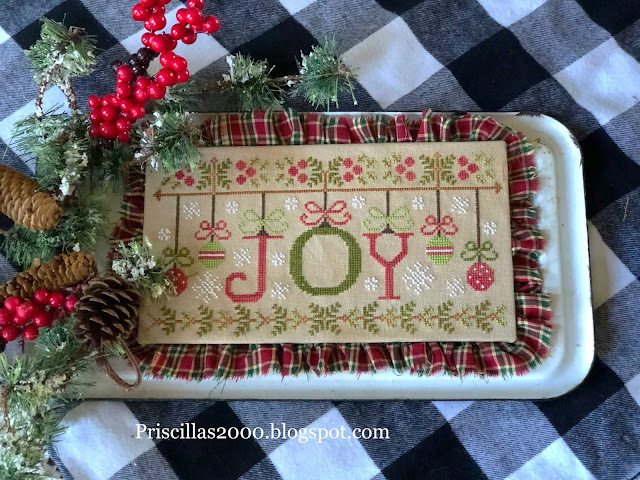 I found this little rusty baking pan at a flea market ...and this fit perfectly ! 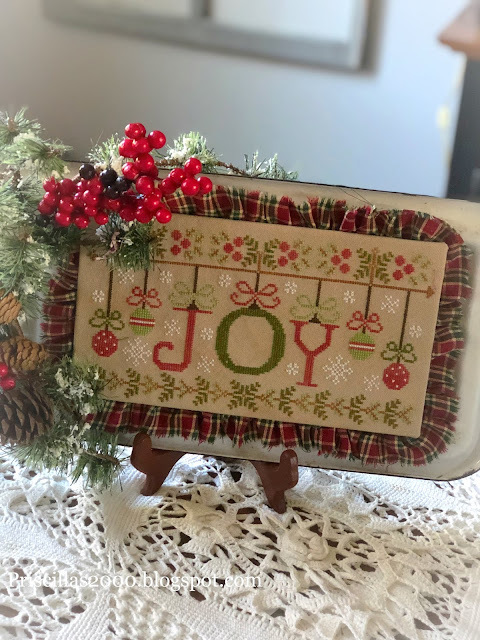 I mounted it on sticky board ..added some mini poms from Lady Dot Creates in the color Jack ..I added magnets to the inside of the pan and washers to the back of the stitching . 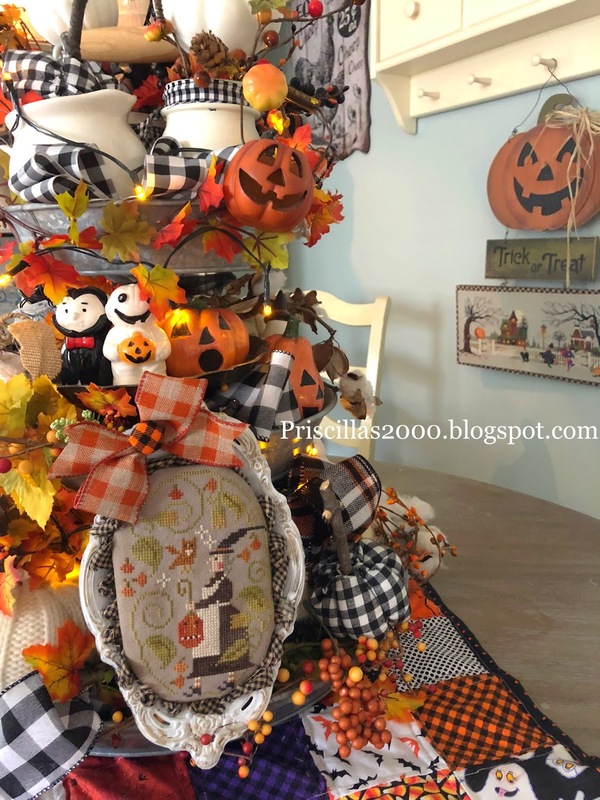 I made a bow for the top from orange buffalo check and added a velvet pumpkin .. I also put that on a magnet .. 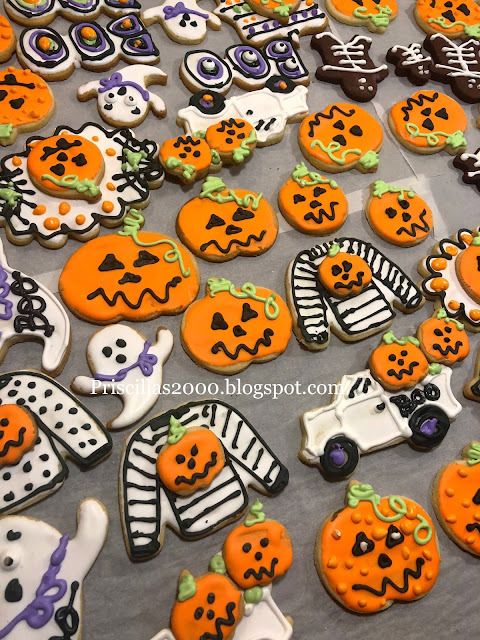 I might need to stick another piece in the pan so I need to be able to change it out!